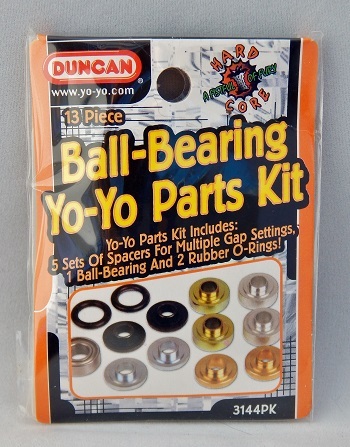 Duncan ball bearing parts kit included replacement parts that worked for all Duncan Hard Cord ball bearing yo-yos. Or, you could use the kit to upgrade or change your yo-yo's performance to suit your own playing style. The kit could be used with these Duncan yo-yos: Avenger, Ballistic, Bumble Bee, DragonFly, Freehand, FH Zero, Throwmonkey, Flying Panda, Cold Fusion, Freehand MG, Mosquito, and Speed Beetle.